A compilation of evidence-based strategies for strengthening population health programs, tapped from the industry’s most progressive organizations. Shaped by recent mandates around accountability and value-based care, the new healthcare culture is centered on the patient. Population Health has become a leading imperative as organizations strive to manage risk, reduce readmissions, and deliver exceptional care quality. The Leaders' Guide to Population Health combines the most effective and innovative strategies for improving population management as tested by the nation’s top organizations. Discover a new care management model proven to support better coordination across multiple specialties, departments, and care providers. Find out how Intermountain’s comprehensive care clinic has driven primary care transformation and improved quality outcomes for complex patients. Learn how to use analytics to better understand the common challenges with and needs of complex patients. Understand the role that community resources play in helping patients better manage their own care. The move to population health management is now well underway; organizations are exploring strategic initiatives, executing mergers and acquisitions, investigating risk-based financial models, and investing in IT infrastructure. 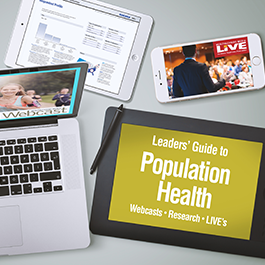 Learn what strategic initiatives are most popular for improving the health of a defined population. Discover what healthcare leaders say are the top three IT infrastructure investments. Explore what financial risk structures healthcare leaders are planning to use within three years. Read how Virtua created a community-based health manager program that is significantly reducing the average cost per patient. Discover the initiatives Tift Regional Health System is undergoing as it transitions to a population health model. Leaders from St. Anthony’s reveal their model for integrating urgent care centers with hospitals and health systems, including lessons learned from development and key strategies for staffing, structuring, and streamlining the care continuum. Assessing, planning, and coordinating care while trying to remain cost-effective has long been the goal of case management. Now, thanks to The Affordable Care Act, case management has the opportunity to make significant contributions to the healthcare delivery system, helping to improve healthcare quality and efficiency, decrease costs, and facilitate transitional care.